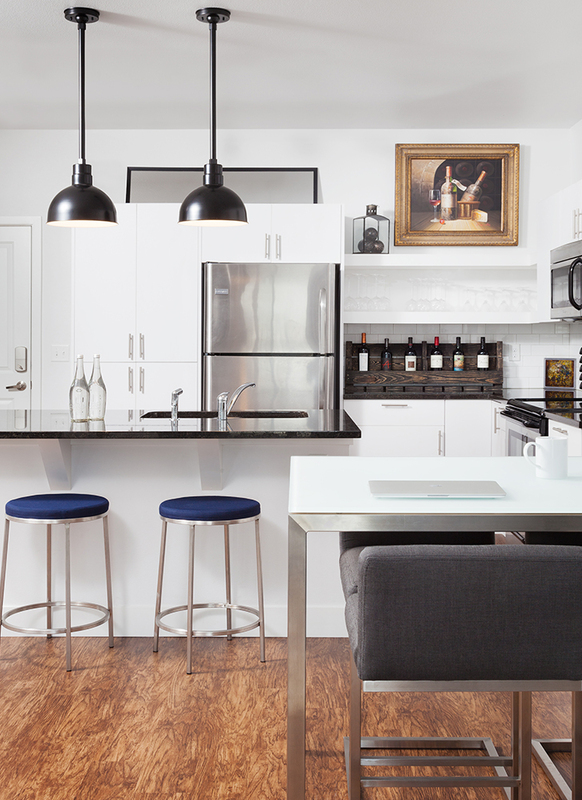 Joe Akmakjian describes his style as "modern contemporary", which is why he turned to Room & Board when he was searching for a dining table for his new, open-concept apartment in downtown Fort Collins, Colorado. Not only did he want it to fit his personal aesthetic, he needed a table that could be customized for his specific needs and would fit his small space. 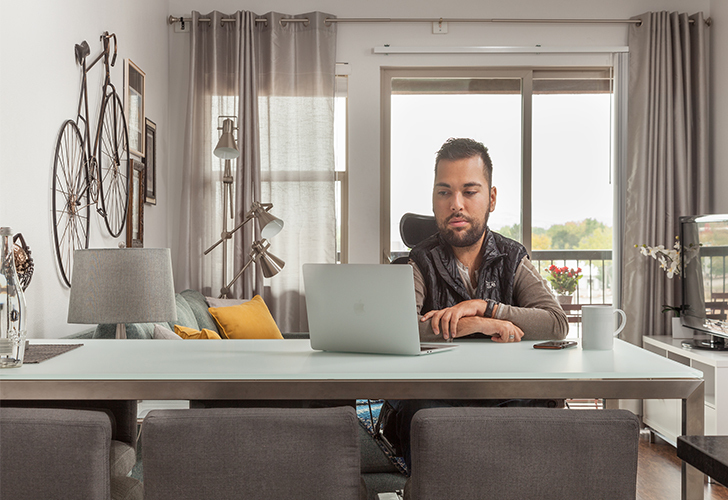 Diagnosed with spinal muscular atrophy when he was 15 months old, Joe has certain requirements when it comes to finding furniture that works for him. 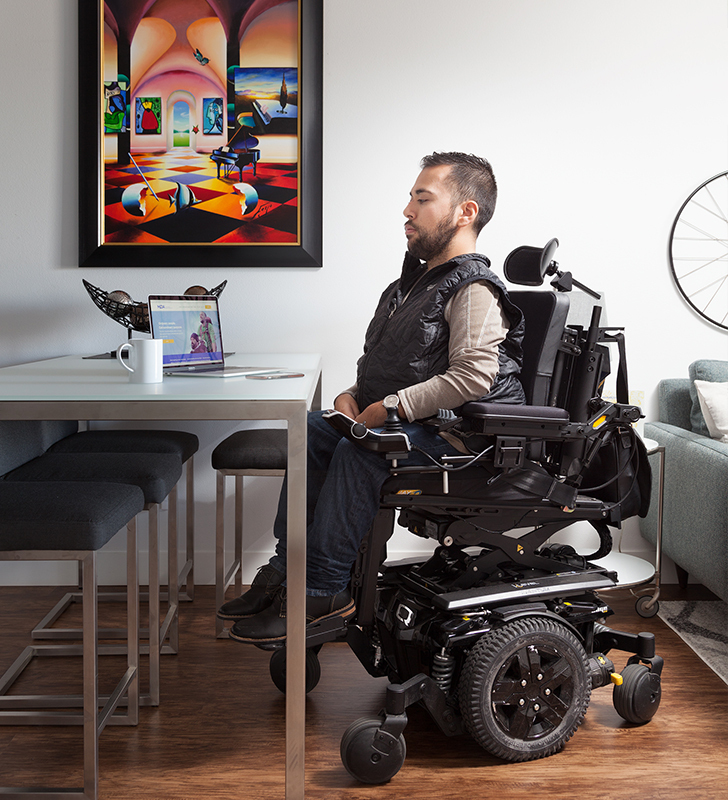 "For me, it's difficult to find a table that is just the right height to accommodate my wheelchair and, since I've always loved Room & Board, I was excited to find something I could customize for my needs that also matched my style." Initially, Joe reached out to us because he was excited about the ability to customize a dining table with the exact height dimensions he needed. We loved the use of our custom options and wanted to be part of his story, so we partnered together to help bring functionality into his new home by gifting him a dining table and chairs, as well as stools for his kitchen island. 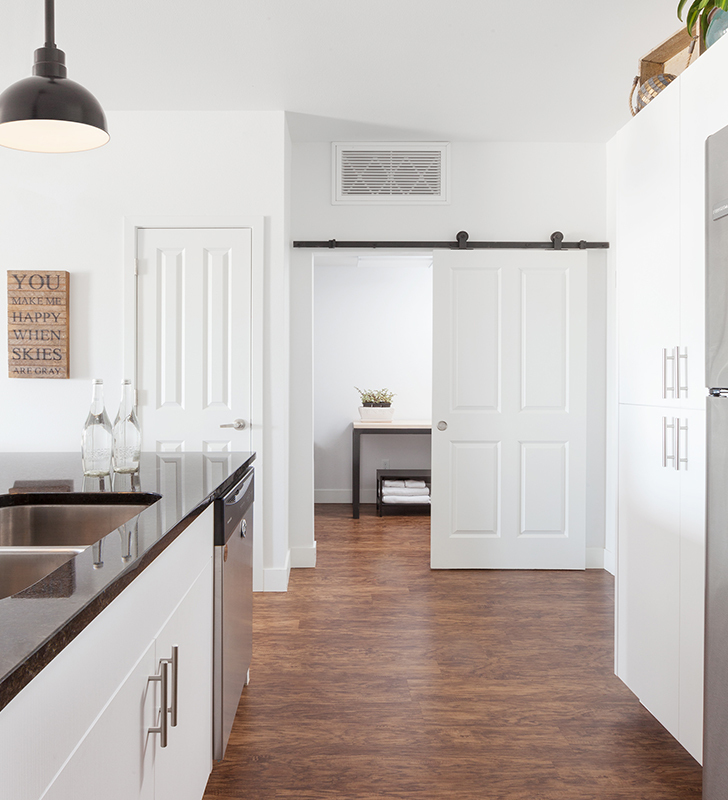 In order to make sure he was getting exactly what he wanted, Joe connected with Design Associate Tim Danen, who helped him choose the right furniture for his needs and space. Looking back on the experience Joe said,"It was great working with Tim. I had some ideas for what I wanted, but I didn't really know exactly. He helped me understand how to work with my space and what size table would fit best. Tim definitely got my style and had great suggestions." For example, Joe had initially wanted a walnut top for his table but after talking with Tim, decided the white glass would tie the kitchen into the dining room nicely. For that reason, Joe chose a custom 35" tall Portica table with white glass top. He also went with Lira counter stools, which fit well with the custom height of the table. Tori counter stools in Sunbrella® canvas blue give the kitchen a bright yet neutral pop of color. 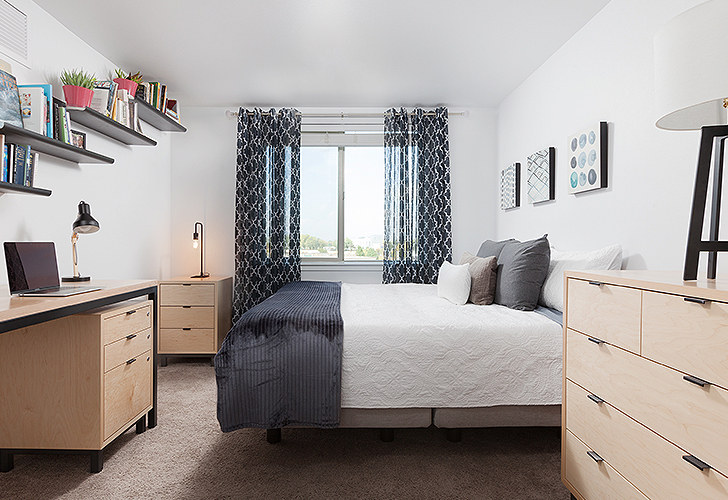 Joe was extremely happy with the final look of his place, saying, "It looks amazing and I couldn't be more pleased. It's all I wanted and more. I've gotten so many compliments from everyone who comes over." Joe also purchased a few more Room & Board items to complete the contemporary aesthetic of his home. 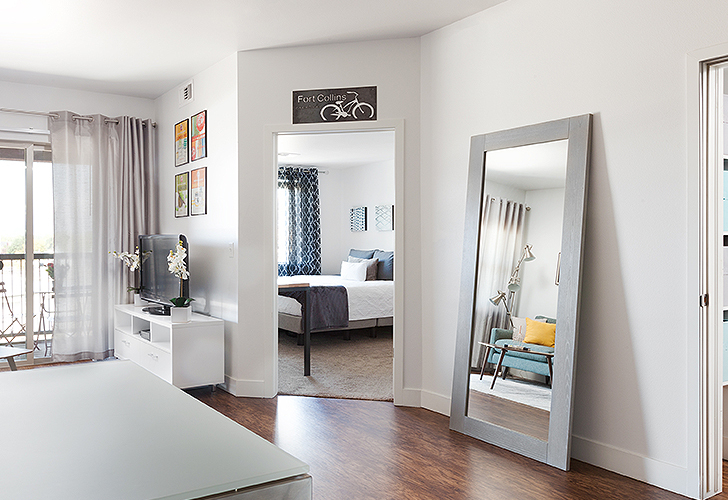 Tour the rest of Joe's modern apartment below. Looking for help with your own home? Learn about our free design services! A custom Parsons table creates a place for Joe to fold clothes in his laundry room. A view from the dining room in Joe's apartment. 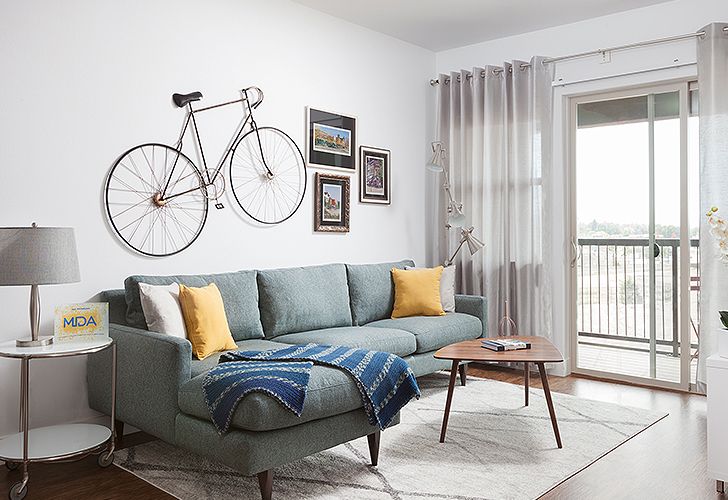 The Jasper sofa with chaise is the perfect size for Joe's small living room. Currently, Joe is the National Ambassador for MDA. 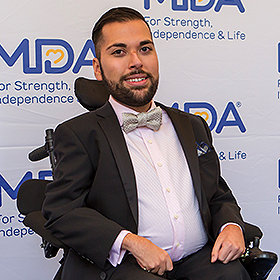 He helps build public awareness and understanding of muscular dystrophy and related diseases. According to Joe, his "dream is to inspire all types of people to live beyond their perceived limitations and achieve success inside them." When he's not working, Joe enjoys swimming, nights out with friends, live music, dancing, festivals and traveling. He welcomes new experiences and is always trying to grow as a person. For more on Joe, follow his journey on Facebook, Instagram, Twitter, and Snapchat @joeakmakjian. Room & Board gifted the Portica table, Lira counter stools and Tori counter stools to Joe Akmakjian for his dining space. Nice post !!!! Love all these lovely furniture. Lots of inspiration. Thanks………..